I finished this table the summer of 2003 and thought it would make a good example to show how I produce my large one-of-a-kind pieces. I found this unique "previously owned" coffee table in a thrift store, and couldn't resist it because of the intersting shape. It had a little water damage, and was covered with an odd opaque simulated burl finish, but once we stripped the old finish off we discovered a neat veneer with burl veneer edges and burl center medalion. I had been working with some Pictish swirl designs, and thought the lobed shape would be perfect for something similar. 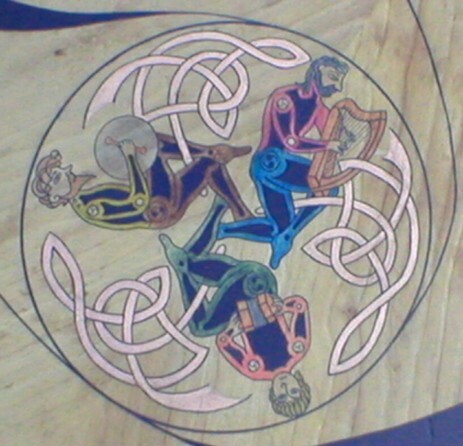 The final design includes three circles containing stylized Celtic musicians, with a "wind" section in one circle, the string section in another, and the harp, squeezebox and drummer in the third. Around the edge of the table is a paraphrase from the song "Molly O'Malley's": "Is this a place of many souls, or just one very large one. Is this a place of many songs, or just one very long one." I first measured the table and laid out its outline to scale on graph paper. I wasn't sure what the "theme" of the table would be at this point, but I started playing with options for the Pictish swirl that would make up the overall design. 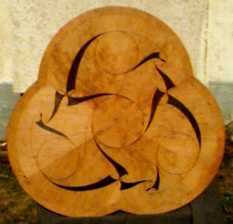 Due to the odd shape of the table I thought it would be best to design my own swirl design rather than reproduce one based on an historic example. Then one morning, while driving out to the MN Renaissance Festival, we were listening to a CD of Lojo Russo's band "Funk's Grove." 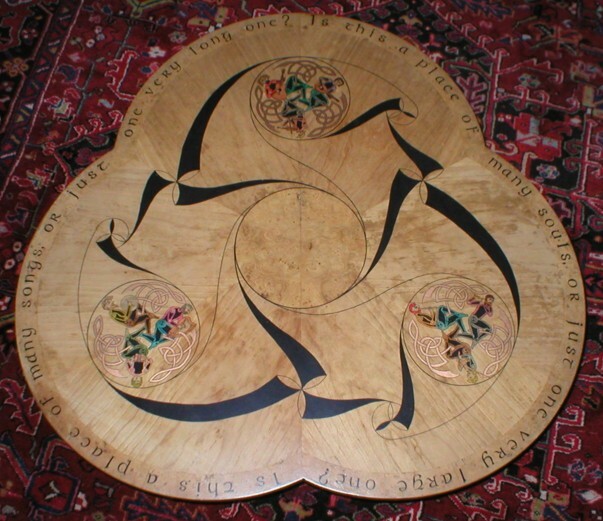 I got a familar shiver down my spine that I occasionally get when an idea hits me, and I decided to fill in the circles with Celtic musicians, and letter a paraphrase of a song from the CD on the burl edging of the table. 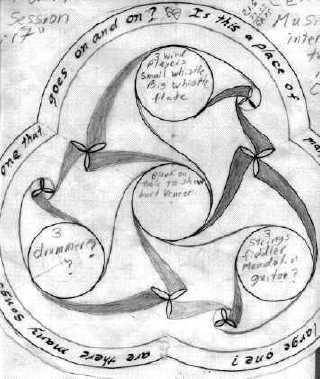 Once the design was on paper, I marked the circles on the table in pencil with a very large compass. Then I added the large sweeping curves, with help of the compass where possible, but primarly they had to be sketched in free-hand. On this table I was lucky because seams in the veneer helped provide reference points for measuring and laying out the design. When the pencil lay-out is complete, I ink-in the design using good-quality technical pens, and then paint in the large black areas. At this point, I really needed to start on the hard part: creating the musicians for the three large circles. So, to put off having to do the "real" work, I lettered the words around the edge of the table, while I let the idea ferment in my addled brain a while longer. Once I completed the lettering, I had to sit down and really decide how to lay out the musicians. 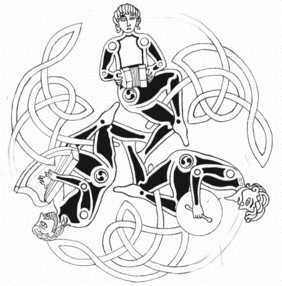 I knew I had to leave their upper-bodies free to play their instruments, so my first step was to decide how the legs inter-twined. 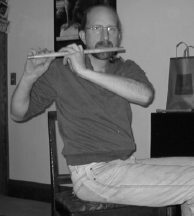 When I had figured out a plan for the legs, I hit on the idea of having my wife take a series of photos of me holding various instruments to use as models for the upper bodies of the musicians. By now the worst of the creative work was done and it was mainly just sitting down and doing the drafting work. I chose a selection of heads from the Book of Kells to use to "top off " the musicians (because I hate doing faces), and I did a free-form, sweeping knotwork design to represent the music coming from the instruments to fill the spaces between the players. In coloring the final design I use a combination of paints, inks, or stains. I like using transparent inks because you can still see the beauty of the wood grain through the color, and it gives an illusion of being marquetry, or inlaid pieces. In working on "recycled" tables such as this, I am never sure how the non-opaque colors will be absorbed into the surface. In this case, some colors ended up darker than I hoped, and some did not appear to be there at all, even after 2-3 coats, so I had to change colors from my original plan. I rely alot on the advice of my wife for the selection of colors. I think her best idea for this work was using metallic copper paint for the loops of "music." It makes the music knots stand out a little from the other art, but is still subtle enough against the wood grain, and mostly muted colors of the rest of the piece. The last thing I have to do before sealing the art is to go over the table inch-by-inch to find and erase any remaining pencil marks from the lay-out work that I missed earlier before coloring the design, or were not covered up by the ink and paint. I prefer to use a "satin" finish polyurethane rather than a gloss finish with the idea that the light reflections off of a gloss finish distracts the viewer from the artwork underneath. Some of the inks that I use can bleed, or be smeared by simply brushing a coat of sealer over them, so I spray on several very light coats to seal the artwork first. When it has been sealed I can then brush on several more coats to finish sealing the table and give a thorough protective cover over the art.